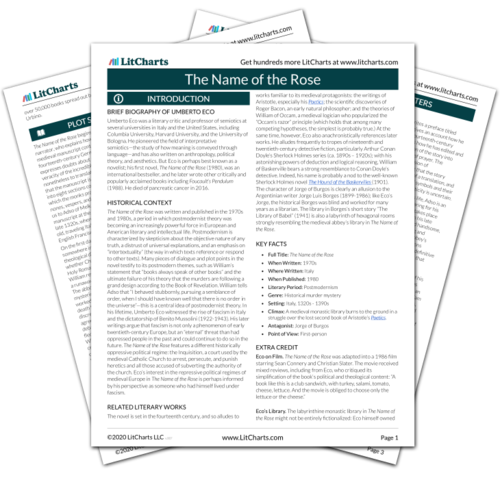 Instant downloads of all 942 LitChart PDFs (including The Name of the Rose). 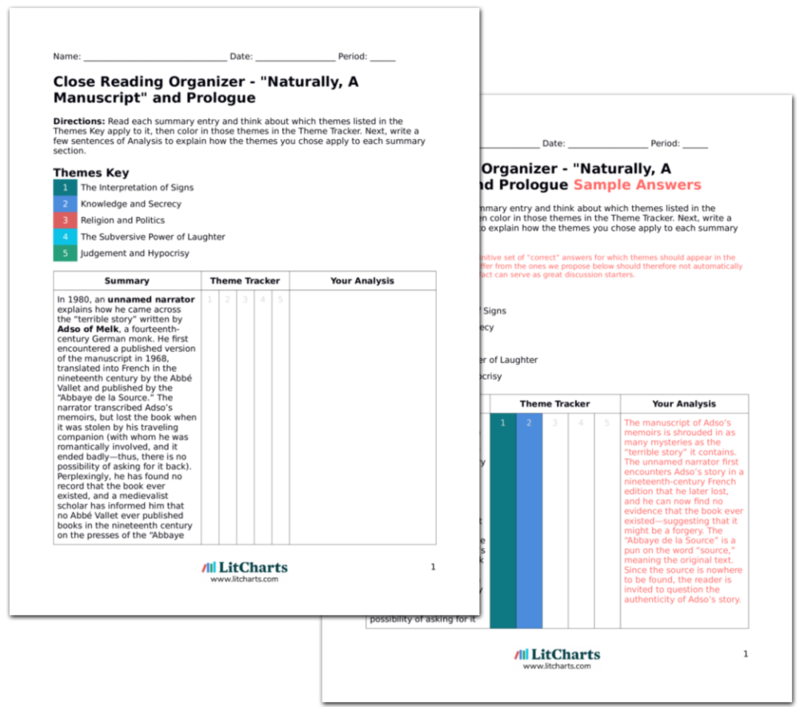 LitCharts assigns a color and icon to each theme in The Name of the Rose, which you can use to track the themes throughout the work. At morning prayers, the monks chant the “Sederunt,” which gives Adso comfort. But then Malachi collapses in church and dies, saying “He told me…truly…It had the power of a thousand scorpions.” William sees that the fingers of his hands are also blackened. Jorge weeps and says “it will never end.” Nicholas is appointed cellarer to replace Remigio, but the post of librarian remains vacant. Benno is told to ensure that the scriptorium continues to function. Alinardo, Aymaro, and a group of other Italian monks appear pleased that “the German” librarian is dead. They say that the new librarian should know Greek and Arabic. William observes to Adso that everyone who has died with blackened fingers—Venantius, Berengar, and Malachi—knew Greek, so the next victim will probably know it as well. He suggests that they warn the abbot, who is one of the few remaining people who knows the secret of the finis Africae. “A thousand scorpions” is one of the apocalyptic punishments in the Book of John, so Malachi’s dying words seem to provide further confirmation of William’s theory that the murders are following an apocalyptic pattern. Meanwhile, the complaints against “foreign” librarians suggest that there is a history of animosity at the abbey based on nationality. Alinardo and Aymaro imply that Malachi didn’t know Arabic, and thus that he was not qualified for the position of librarian. All these clues suggest that the secrets of the library somehow relate to the history of factions, alliances, and grudges at the abbey. By understanding more about this history of rivalry, William and Adso might be able to learn more about the forbidden book. In his new position as cellarer, Nicholas invites William and Adso to the abbey’s crypt, where he tells them some secrets of the abbey’s history. The abbey is vastly wealthy, as Adso realizes from the precious gold, silver, and jewels stored in the crypt. By tradition, Nicholas explains, the librarian eventually becomes abbot. This was why some of the Italian monks—like Aymaro and Alinardo—grumbled against the appointment of foreigners to the role. It is possible that Malachi and Berengar were killed, he suggests, because someone didn’t want them to become abbot. Nicholas then shows them the rest of the treasures of the crypt, including relics of saints—for example, a splinter of the cross on which Christ was crucified. William observes wryly that the relics are probably not authentic, but the gold and jewels are. “This crypt is a beautiful epitome of the debates on poverty,” he tells Adso. The abbey’s vast wealth explains why the monks “make mincemeat of one another” as they aspire to the position of abbot. The crypt demonstrates why the monks are arguing so vehemently about the poverty of Christ. If Jesus had been poor, then the abbey can’t justify keeping such a store of treasure in the crypt without looking hypocritical (not to mention their 150 servants, vast landholdings, and fine meals at the dinner table). The position of abbot is a spiritual one, but the conflict between the Italians and “foreigners” over who should become librarian and then abbot demonstrates that it is also a political appointment. The monks “make mincemeat of one another” in aspiring to the role because they each want control over the abbey’s wealth and power. Eco thus shows that religious power and political power are so deeply intertwined that it might be impossible to separate them. Listening to the “Dies irae,” Adso has a vision. He sees Abo, Jorge, Bernard, other monks, and various Biblical figures arrayed for a feast. But the feast soon descends into drunkenness and violence, and people begin to attack the girl from the village, torturing her and turning her flesh into a “deaf and blind ruin.” Ubertino tells Adso that this is the price of sin. Suddenly, Salvatore enters, and Adso imagines that he is inside a great flame, but is no longer afraid, for “now I knew all about the mortal human body, its sufferings and its corruption.” The figures return to the feast, restored to normality, and Adso sees the girl, “whole and most beautiful,” who tells him that they will meet again in heaven. The Pseudo Apostles come in and crown the Emperor with the approval of the people. Pope John appears, shouting in confusion, but everyone ignores him and goes outside to hunt truffles in the forest. Adso’s dream provides a series of symbols for him to interpret. He dreams of a world in which traditional power hierarchies are reversed, suggesting that events at the abbey have upset his understanding of the order of society. Truffles, for Adso, are a symbol of the way language can take on different meanings for different people. This suggests that the potential meanings of the dream are manifold. It is up to Adso to choose the correct interpretation from a wide range of possible readings. William tells Adso that he has already seen the secret of the finis Africae. This implies that something in this dream vision has revealed the truth of what is hidden in the library, if Adso can only understand what the dream means. The world always provides signs, even if isn’t always obvious how to interpret them. 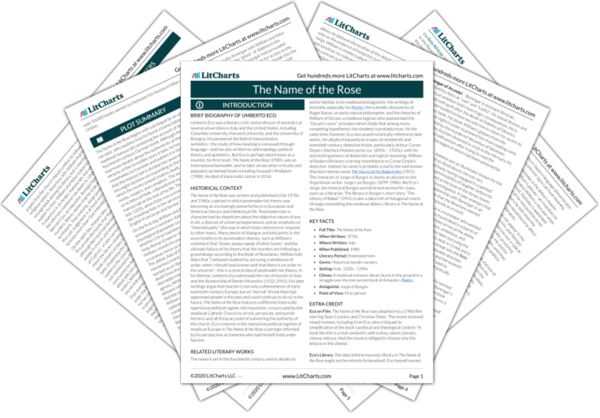 Get the entire The Name of the Rose LitChart as a printable PDF. William’s statement that Adso’s dream can be read like “an allegory” suggests that the things he dreamed about are symbols for something else. He points out that Adso has dreamed of a Latin carnival comedy in which Biblical figures are depicted doing indecorous things and the world is described “upside down.” The Coena’s depiction of a topsy-turvy world is somehow relevant to the forbidden book. Perhaps Adso’s dream implies that the book challenges conventional power structures and social hierarchies. The library catalogue poses many questions that William and Adso will have to interpret. All the evidence seems to point to another, mysterious librarian whose name is lost in the historical record. However, William is still cautious about making any hypotheses. He now simply has more evidence, which he will use to try to understand the history of the library and the identity of the unknown librarian who wrote the forbidden book’s catalogue entry. This demonstrates that gathering signs and evidence is not sufficient. William still has to interpret the signs before they will add up to anything meaningful. William asks Benno whether anyone mentioned the Coena in the discussion about riddles. Benno confirms that Venantius did, and Jorge became furious, reminding everyone that the book had been forbidden by the abbot. Benno asks to speak with them in private. He confesses that he is afraid that since someone killed Malachi, he might be next, especially since the Italians don’t want another foreign librarian. Apparently the Italians “often spoke of Malachi as a straw man…put here by someone else.” William asks Benno whether he read the book before he returned it to Malachi, and Benno says that he did not; he confirms that the book begins with an Arabic text, followed by texts in Syriac, Latin, and Greek. This book, then, is indeed the forbidden book they saw in the infirmary and identified in the catalogue. Benno describes the pages of the Greek text as “damp” and “strange,” and William realizes that it is written on linen paper. The Coena is a forbidden book because it is an irreverent, comedic take on Scripture. This explains why Jorge hates is so much, with his well-known bias against laughter. Benno provides some more useful clues and signs, including that the Coena is written on linen paper. This is significant because paper is a less common writing technology than parchment, and so the book is distinctive and will be easier to recognize. All these signs are bringing William and Adso closer to being able to recognize and find the forbidden book. It is still unclear how the unnamed librarian figures into all this, but William’s hunch seems to be that finding the forbidden book will require understanding the shadowy history of the library. William asks to speak with the abbot in his apartments. Abo reflects on the beauty of the abbey’s Aedificium and its perfect symbolic proportions, having three stories, which is the number of the Trinity, of the days Jesus and Lazarus passed in the sepulcher, and of the times Christ appeared to his disciples after the Resurrection. William politely asks him to get to the point. Abo sees the proportions of the Aedificium as symbolically meaningful in the context of the Bible. William, by contrast, is no longer impressed by this mode of interpretation. Instead, he wants to solve the more pressing problem of the murders. This suggests that Abo is satisfied with interpreting signs in a way that confirms his existing view of the world, while William is trying to push the boundaries of human knowledge. Abo tells William that he is disappointed with his inability to solve the mystery. William admits that he has not lived up to expectations, but tells the abbot that he now believes these crimes stem not from a vendetta among the monks, but “from deeds that, in their turn, originate in the remote history of the abbey.” The key wasn’t Remigio’s heretical past, or the illicit relations between Berengar and Adelmo. Rather, everything turns on the theft of a book from the finis Africae. Abo demands to know whether William has contravened his orders and entered the finis Africae, but William lies and says he knows this only through his powers of deduction. He presents Abo with his hypothesis that the crimes have been committed by someone who hopes to prevent people from discovering a secret in the library. All the people who might have known it are dead, except the abbot. William has been looking for a pattern to explain the murders. But Remigio’s involvement with Fra Dolcino and the sexual relationship between Berengar and Adelmo turned out to be false leads. This demonstrates that the search for an overarching pattern can actually obstruct the search for truth, in some cases. It turned out that the key to solving the mystery was the forbidden book. William was not able to recognize this for so long because he was caught up in trying to come up with a theory that would explain all the events at the abbey. Abo believes that authority alone can determine the truth. For Abo, authority is necessary to tell people what is right and wrong. Without authority, people are unable to understand signs. Abo’s belief that only authority can distinguish between correct and false interpretations suggests that he has a hierarchical, inflexible view of truth in which there is a single “correct” answer. William interrupts and demands to know why Abo has changed the subject instead of naming the murderer and explaining the nature of the forbidden book. Abo tells William that he doesn’t expect a Franciscan to understand the sacred ways of the Benedictine order. From now on, he says, he will investigate the murders himself, under his own authority as abbot. He thanks William for his work and asks him to leave the abbey the next morning. Abo seems to think that William has gotten too close to uncovering a secret in the abbey, so he plans to close ranks and investigate the murders himself. This is not just a dismissal but an expulsion, Adso recognizes. He and William have no choice but to leave the abbey, as the abbot commands. Abo’s stern response to William’s questions suggests that he is trying to hide something—perhaps something that compromises the reputation of the abbey. William’s statement that they must “know” demonstrates his personal determination to satisfy his intellectual curiosity and know as much as he can. William believes that the human capacity for rational thought is what separates people from other creatures. He thinks that people should strive to push the boundaries of knowledge, because that’s what it means to be human. However, he also acknowledges that full comprehension remains out of reach. This demonstrates his intellectual humility and understanding that there is a limit to the human ability to interpret the signs of the world, which are sometimes mysterious and inexplicable. Adso suggests a third hypothesis: perhaps Abo wants to solve the murder on his own in order to prevent the faction of Italian monks from revolting against “foreign” librarians. William determines that they must enter the finis Africae, since “the final answer must be there,” and in doing so save someone’s life. Meanwhile, there is a commotion outside the Aedificium. The Italian monks are clustered together, whispering, and Jorge heads toward the chapter house with Nicholas. Benno tells them that the scriptorium is in chaos and no one is working. William suggests that with Malachi and Berengar dead, everyone is looking for a scapegoat. He goes to lie down for a few hours, which Adso finds perplexing, but observes that William thinks best when he’s had more rest. If William and Adso can break into the finis Africae, they will understand why someone has been murdering his fellow monks. They might even save a life, since the murderer will no doubt strike at anyone who tries to read the forbidden book. This demonstrates that the library’s zeal for secrecy has been the motivating force behind all the calamities that have befallen the abbey. Understanding the mysteries of the library will thus also reveal the motivation for the murders. That night, Jorge is absent from vespers. Benno is also absent (he is closing the scriptorium), along with Nicholas (who is making dinner) and Alinardo (who is not well). When these facts are pointed out to Abo, he becomes visibly irritated. One of the Italian monks mutinously mutters that Abo behaves like “the whore of Avignon.” Several hours later, Jorge is still missing. William asks Nicholas where Jorge had gone earlier that day, and Nicholas says he accompanied him to a long meeting with the abbot. At compline, Abo asks the monks to pray for Jorge’s health, and orders that no one should walk outside the dormitory that night. After everyone has gone to bed, William and Adso observe Abo entering the Aedificium alone. Abo’s anxiety about the missing monks is in keeping with the atmosphere of paranoia and tension that has overtaken the abbey. Mutiny seems to be brewing in the ranks when one of the Italian monks insults Abo for being too close to the Pope. In short, the struggle to keep the forbidden book secret has brought the community to a breaking point. Salvatore unwittingly provides the key to entering the finis Africae. With his mangled Latin, he said “tertius equi” (“the third of the horse”). This means something entirely different than “the third horse.” When Adso recounts this story, William has a new hypothesis. He realizes that Venantius’s code refers to the fourth and seventh letters of the word “quatuor.” This suggests that even seemingly inexplicable signs can have meaningful interpretations in the right context. In the kitchen, William and Adso hear a muffled noise. William surmises that Abo tried to enter the finis Africae through a secret passageway and has been trapped inside. William tells Adso that they must hurry in order to save the life of “someone who does not deserve it.” William and Adso go upstairs to the scriptorium, then the library, and finally, the mirror room in the south tower. Adso sets down a lamp on the floor and the flame begins to lick the binding of a book, prompting William to tell Adso to pick the lamp up, asking “you want to set fire to the library?” They open the door to the finis Africae by pressing the “q” and “r” in the word “quatuor,” as Venantius wrote in his notes. The frame of the mirror shudders and the glass surface snaps back, revealing that the mirror is in fact a door. Around midnight, William and Adso enter the finis Africae. Since Abo has been trapped in the secret passageway, he cannot be the murderer. The murderer must be the person inside the finis Africae, who is also the person who knows the secret of the forbidden book and has been trying to prevent his fellow monks from reading it—proving once again that the mystery revolves around the finis Africae and the forbidden book. When William and Adso enter the finis Africae and uncover the library’s secrets, they will also discover the identity of the murderer. Houghton, Eve. "The Name of the Rose Sixth Day." LitCharts. LitCharts LLC, 15 Feb 2018. Web. 18 Apr 2019. Houghton, Eve. "The Name of the Rose Sixth Day." LitCharts LLC, February 15, 2018. Retrieved April 18, 2019. https://www.litcharts.com/lit/the-name-of-the-rose/sixth-day.